The Masonic bodies in and around the city of Atlanta played host to Grand Masters and their delegations from all over North America and as far away as Japan and Bulgaria. The April session entitled, “Cultivating the Masonic Experience” boasted over 800 attendees at the Conference of Grand Masters in North America. “This is an extremely valuable experience,” remarked Rick Reichert, Grand Senior Warden. 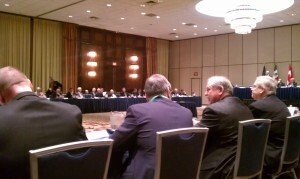 “It’s a great place to network with other Grand jurisdictions, share ideas, and talk with champions of the Craft. The event consists of the council of Grand Masters or their representatives who handle matters that cross jurisdictions, such as recognition of other Grand Lodges. However, the greatest value is the ability to talk in smaller groups about the great things in Masonry. Each jurisdiction has its unique ways of doing certain things, but the universality of Masonry is the amazingly reinforced. In addition to the plenum sessions there are several break-out sessions through the conference with a variety of topics on interest to the Craft conducted by well respected brothers. Brother Cliff Porter was one of the presenters and will join us in Salina for our Annual Communication in March. 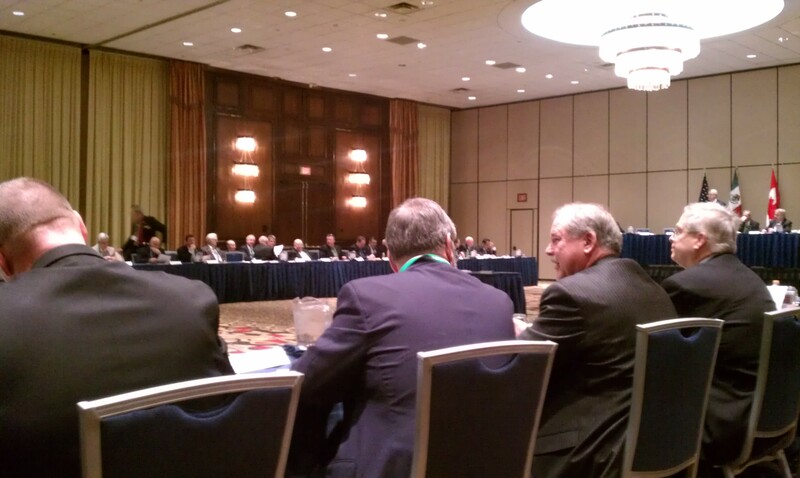 The 2013 conference will be held in Kansas City jointly hosted by the Grand Lodges of Kansas and Missouri. It will be held at the Sheraton near Crown Center and the Grand Masters to be are looking forward to the trip. With the birth of Vision 2020, our Grand Lodge Strategic Plan adopted by the Craft in 2010, a lot of questions have surfaced. How do we achieve so many of these goals? Your Grand Lodge has worked tirelessly since then with the focus of achieving these goals. One goal in our Strategic Plan concerns our image and visibility to the public. With that goal in mind, a bill permitting Masonic personalized license plates was introduced in the Kansas House of Representatives Transportation Committee on February 1st. R:. W:. 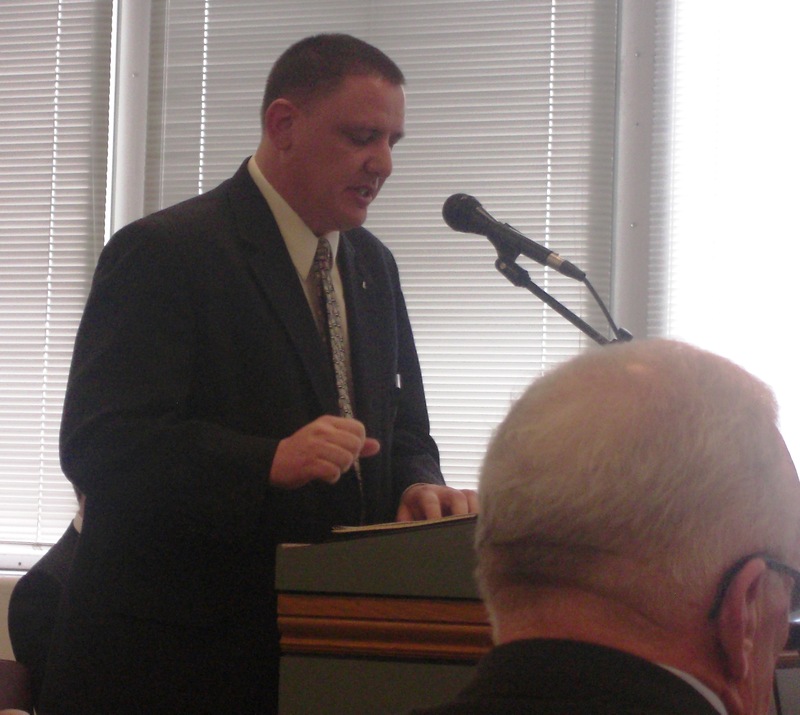 Joesphe G. Stiles, Assistant Grand Secretary addresses the House Transportation Committee about the Masonic License Plate. R:. W:. Joesphe G. Stiles, Assistant Grand Secretary, presented House Bill No. 2499 to this committee and stood for questions. The bill, upon passage into law, would allow for the production of a Kansas Masonic License Plate with funding from the plate to be used in part for the Grand Lodge Library and Kansas Masonic Charities Inc. While many details of this bill and program are being worked out, it has cleared the committee and arrived on the House Floor for a vote. As with all House Bills, once they have passed, it will be presented to the State Senate and finally the Governor for his signature. Once published in the Statute Book as law, the Grand Lodge can begin coordinating with the Director of Motor Vehicles to finalize the design and logistics of getting this plate available to Kansas Masons. 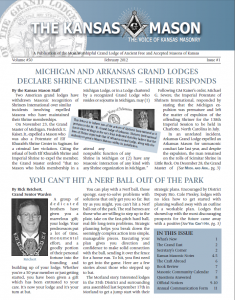 This project helps Grand Lodge accomplish a great number of things towards our Strategic Plan. having our Masonic Emblem on License Plates goes along ways towards improving our Image as well as making it a more recognizable symbol. The funds raised from these plates would allow the Grand Lodge Library to enhance its collection as well as be a better conduit for providing Masonic Education to local lodges thus improving the Masonic Experience. 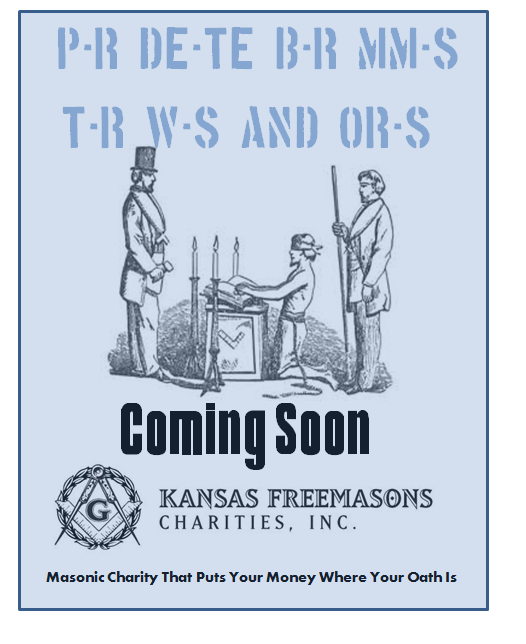 Funding from these plates applied to our newest charity, Kansas Freemasons Charities Inc, will make great strides towards ensuring that the charity is fiscally sound and able to perform its duties. Many Masons will also have an opporotunity to make their plate a bit more personal by celebrating their achievment of being a Past Master or other roles through the adoption of smaller decals applied to the plate. This is still being developed by Grand Lodge as well. No large program like this has ever been successful without help and support from the craft. We ask that you visit with your State Representative and Senator while this bill is moving through the Capital Building and show your support for this bill. Check back with the Grand Lodge Website for updates on this project. Click the Link Below to find your House Rep and Senator. Job’s Daughters will be providing childcare at this year’s Annual Communication in Salina (March 16), as a service to Grand Lodge and as part of their fundraising efforts. Children must all be from the same immediate family to get the quantity discount. Parents will be required to fill out a form providing the following information when dropping their children off. RSVP’s must be made by Saturday, March 10th. Drop-In’s may be refused based on availability. 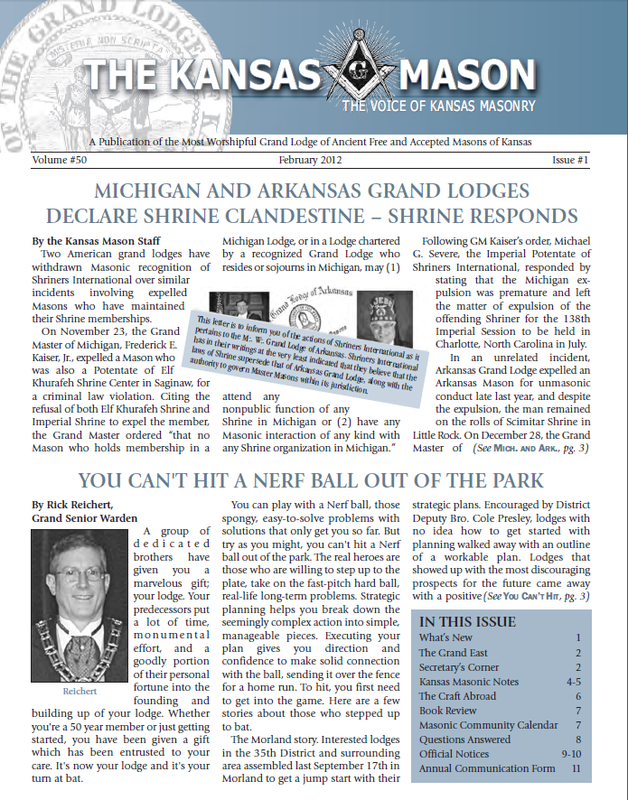 The current issue of the Kansas Mason is now online in advance of the deadline! The paper copy will be arriving in our member’s mail boxes within ten days. Another Strategic Planning Session, Another Success. Following very successful Strategic Planning sessions in Morland and the Leadership Academy in Topeka last fall, Wyandotte Lodge No. 3 hosted a Strategic Planning session on Saturday, January 21, 2012. Rick Reichert, Grand Senior Warden, led the session and started the day with a smooth flowing presentation on the importance of every lodge having their own individualized Strategic Plan to help assure future successes and growth. He outlined the components of making a successful Plan, based on proven business models, and how every lodge should address their specific needs in small steps. He emphazied that every Strategic Plan is uniquely different in respect to each lodge and, that the Grand Lodge of Kansas has absolutely no involvement in making a lodge’s individual Plan other than providing requested resources (such as these sessions). With Reichert’s assistance, over 50 masons from 18 lodges openly brainstormed with each other, sharing thoughts, ideas, and strengths/weaknesses of their lodges. Many participants were able to flesh out major parts of a Strategic Plan, and all participants left with new ideas and a potential game plan for starting a Strategic Plan in their respective lodges. The brethren and ladies of Wyandotte Lodge No. 3 were gracious hosts and allowed access to all parts of their spacious new building. Coffee and pastries were available all morning and a free hot lunch was served at the end of the session. More Strategic Planning sessions are being planned and can accomodate any number of participants. If your lodge would like to host a session, a lodge representative needs to contact your Area or District Deputy Grand Master or Grand Lodge for scheduling with R:.W:. Rick. Arizona Deputy Grand Master Michael Meier has been removed from office by the Grand Master of Arizona, D. Brook Cunningham, on December 26. Unsubstantiated accounts of other high level Grand Lodge officer resignations have also appeared online . Masonic blogger Chris Hodapp has stated that the “Senior Grand Warden and the only other elected officer besides the Grand Master himself have recently resigned, as well,” although no details have been made public. The Grand Lodge of Arizona website offered no information on any of the recent events and as of this writing, Michael Meier was still listed as the Deputy Grand Master. There is no word on Meier’s replacement. This year, like so many other years, Lodges across the state will celebrate their 100, 125 or 150 Year Anniversaries. As the trend seems to follow, only about half of these lodges will actually conduct any kind of an event that recognizes their milestone. Many wonder why more lodges don’t. Is it the amount of work involved in putting on a ceremony? Or is it simply apathy? R:. W:. Don Newman Jr., Grand Senior Warden 2010, assists with the rededication of Benevolent Lodge in Abilene. 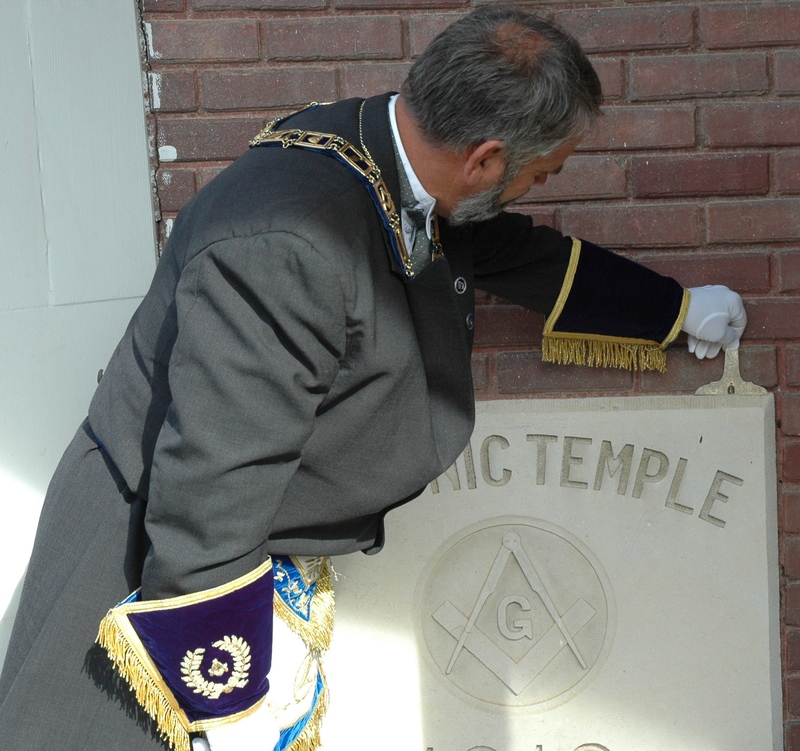 The significance of your Lodges milestone is enormous when looked at from the right perspective. Over the past 100-150 years, so much has changed in our world. So much so that our brethren from the era when our Grand Lodge began would not recognize the world as it is now, but they would Masonry. What seems to stand out is that no matter what problems have risen in the world the Tenants of our Order, Friendship, Morality and Brotherly Love,as well as a strict adherence to our traditions and ritual still apply. Depending on how old your lodge is, it has survived the recovery from the Civil War and the settlement of Kansas, World War 1, the Great Depression and Dust Bowl days, World War 2, the Korean War, the Great Civil Rights Movement , the Vietnam War, the Economic Crisis of the late 70’s and early 80’s and so much more. Even local controversies and changes to our communities have not seen the failure of our sacred tenants. Re-Dedications are not difficult to conduct when coordinated in advance and as a lodge you are not left hanging out in the wind when trying to conduct such an event. Within a week after the Grand Lodge Annual Communication, the District and Area Deputies will have been trained and armed with the proper tools to perform their duties. Part of their duty is to support lodges celebrating an anniversary and assist them in the planning preparation and execution of that event. Reach out to your Deputies and put them to work. Grand Lodge Leadership also stands ready to help with anything that you need to get an event done. Rededication Ceremonies and Anniversary Celebrations are an outstanding way to celebrate who we are, where we have been and more importantly, where we are going. With Christmas right around the corner you still have time to visit our online web store and pick out something for a Christmas gift. Our staff at your Grand Lodge office will do our best to make sure it arrives in time to slip under the ole’ Christmas tree. 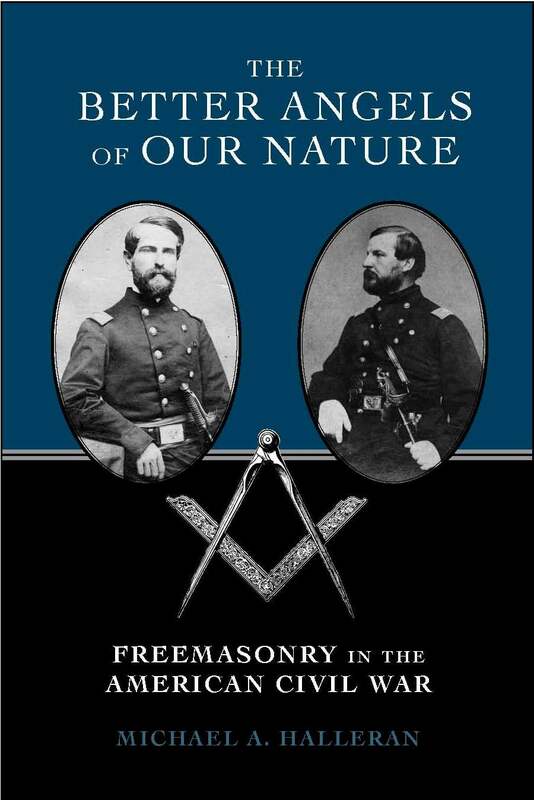 We have many great books on sale including The Better Angels Of Our Nature: Freemasonry in the American Civil War, written by your Grand Junior Warden, Michael A. Halleran, and I’m sure that he would love to personalize the book for you the next time you see him. As you know, Bro. Halleran is an accomplished Masonic writer with many stories published in the Scottish Rite Journal. His Bro. Brother articles were great reads and always a favorite of mine even before I met him. If you took the opportunity to attend the Leadership Academy at the State Capitol building in October, you had the pleasure of listening to several great Masonic speakers, among them Bro. Cliff Porter from Colorado who gave a fantastic presentation. Bro. 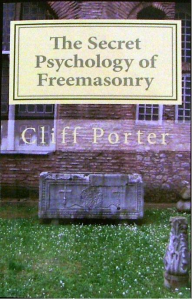 Cliff’s presentation was based on his book The Secret Psychology Of Freemasonry which is a featured item in our web store. While negotiating the best deal possible, Brother Cliff offered to personally sign each copy we purchased, so you can expect a signed copy when it arrives. All other books and items are listed in the new and improved web store, which is much easier to navigate. For ease of purchase you can now pay online with PayPal payment service, you don’t need a PayPal account to make a purchase, either. You can pay with your credit card and we usually get the order out the same day the transaction hits our desktops. So remember, if you’re looking for gifts for the Mason who has everything – be sure to stop by the Grand Lodge store. The attached .pdf contains the schedule for the Fall 2011 and Winter 2012 District schools.